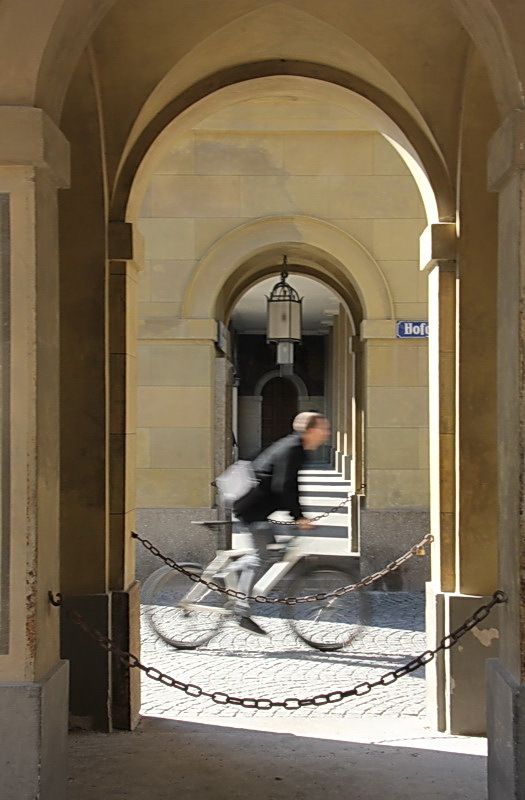 Another shot from downtown Munich. I don’t know how many words it speaks, I’ll let it just speak for itself. What it says to me, in less than a thousand words: Munich is a beautiful place. It wasn’t as difficult to get this shot as you might think since there was an average of two bicycles a minute passing the archway. Still, I was glad to get him nicely centered because I’m taking a photo class (again) and this shot fit the lesson perfectly. I notice I don’t have many ideas for a text to go with my picture. Let’s hope this is a case where a picure speaks a thousand words. 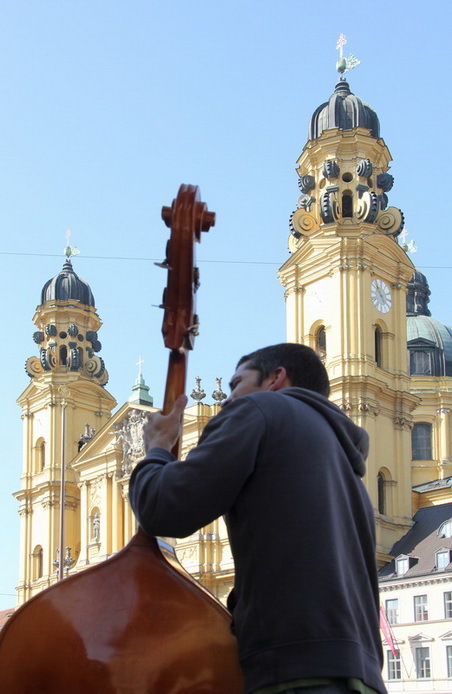 I took this in down town Munich and loved the way the scroll of the bass corresponded to the ornament on the church domes. 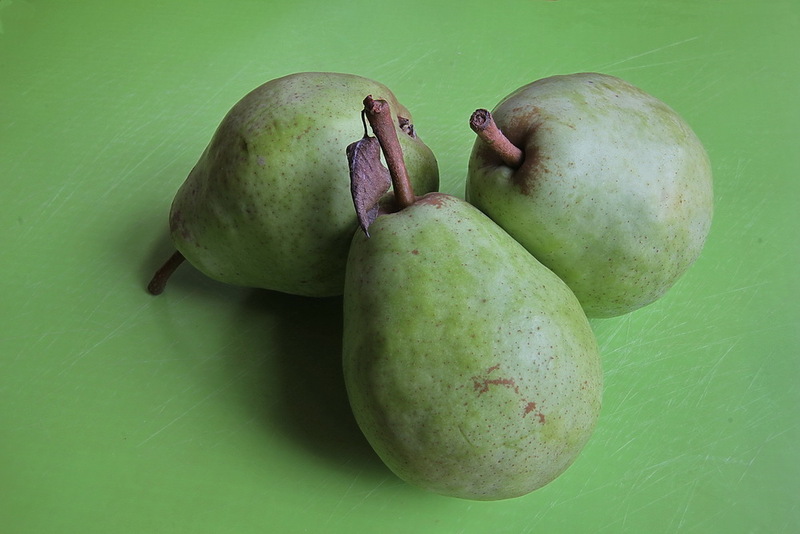 Yesterday I wrote about what I did with my unripe pears. 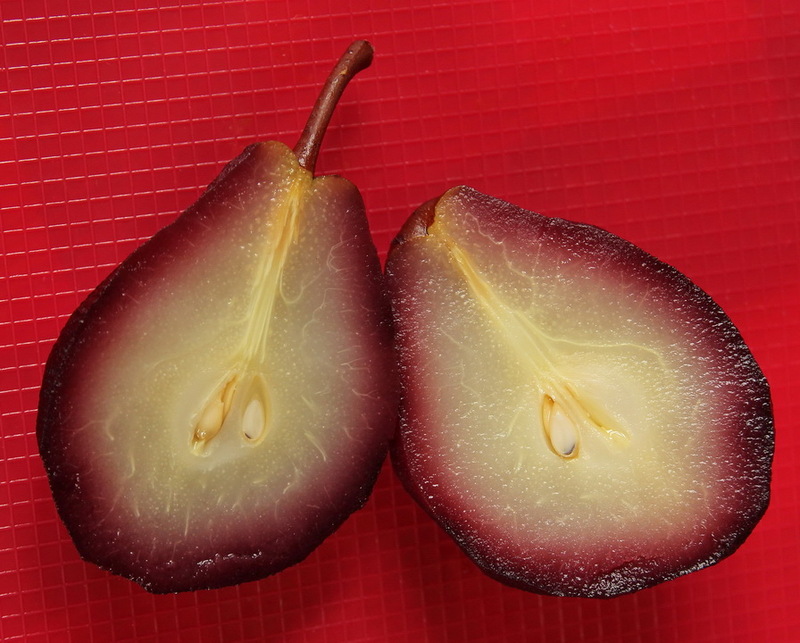 In case you were curious if my hard-as-rocks green pears poached in red wine (with sugar added) were edible, I’m posting the sequel here. Today I sliced one in half to have a look. Just beautiful. Of course, they are meant to be eaten, not just looked at. 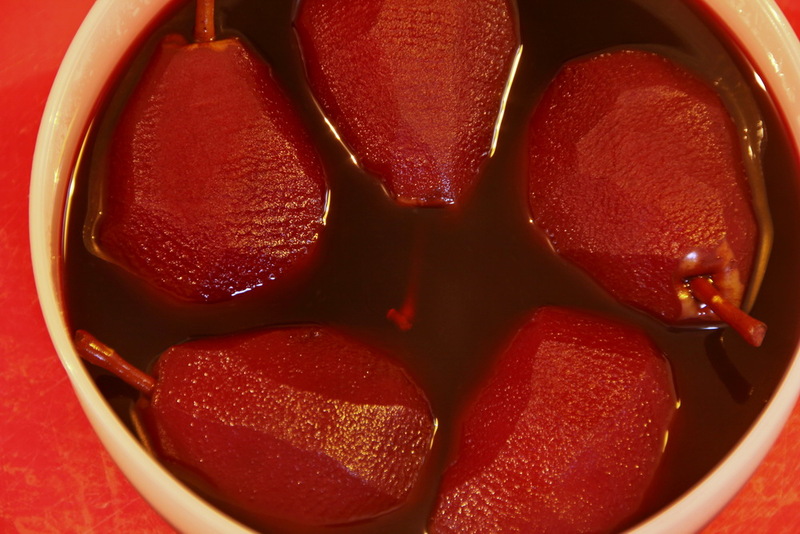 According to some recipes, the red wine should be boiled down to a syrup and poured over the pears, but I haven’t gotten around to it yet. I also read that the pears are best served with vanille ice cream. Yes, and how did the pear taste without the trimmings? Nice, but not exciting. Well, this will not be everything about pears, but I discovered some useful facts about pears that I didn’t know before. If this information from the Internet can be trusted, pears are picked green and held in cold storage to allow their sugar level to rise. They are supposed to be picked green which really surprised me. They will then ripen at room temperature over a period of seven to ten days. I was at the farmer’s market yesterday and bought a kilo of pears. They looked good but when I got home I discovered they were as hard as rocks. I couldn’t imagine that they would ever ripen to be delicious sweet pears but I could imagine they would destroy my blender if I attempted to make a smoothie with them. I’ll never know if they would have ripened. Perhaps I should have waited but I hadn’t yet discovered that tidbit of information on pears in the Internet. Instead I decided to stew them in red wine – voilà, poires au vin rouge. I don’t know how edible these will be either. I haven’t tried them yet. I’m sure I learned more useful things in school, but Roy G. Biv stuck, the mnemonic for the colors of the rainbow, red orange yellow green blue indigo violet, in order of decreasing wavelengths and as we see them. 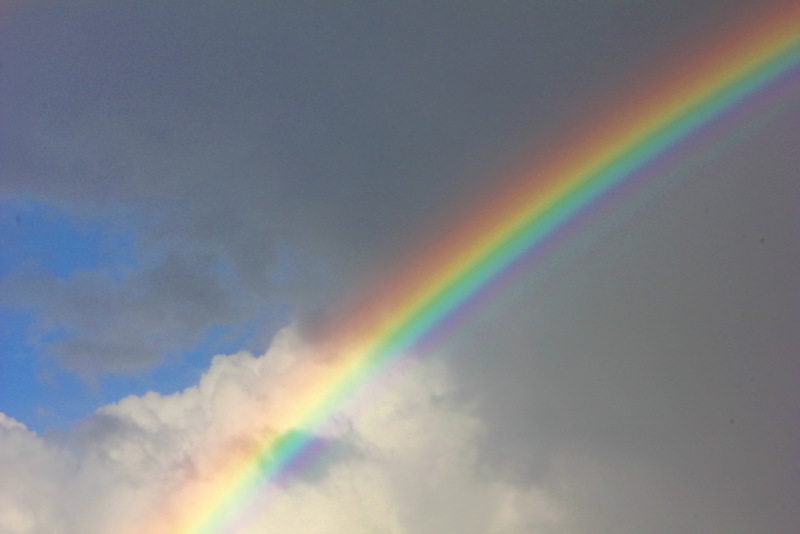 A couple of days ago we had a view of a wonderful rainbow in the eastern sky after an evening thunder storm. And sure enough, roygbiv was there. The colors weren’t so brilliant as to make a sensational picture so I saturated them a wee bit.